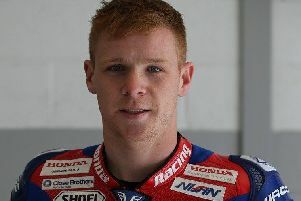 International road racer Gary Johnson, from Broughton, rode to five top-eight results at the North West 200 in Northern Ireland last week. On Thursday he was seventh in the six-lap Superstock race and fifth in the Supersport race, run over the same distance around the 8.9-mile public roads course. Saturday was the main race day, with Johnson taking part in four more races, and the highlight of the day came in the six-lap Superstock race when he just missed out on a podium position aboard the Kawasaki ZX-10R. Ninth at the end of the opening lap, it was close between the leading pack, and by the end of lap three, just 2.7 seconds covered the leading eight riders, with Johnson sitting in seventh. One lap later, this had become sixth as Johnson lapped at 121.578mph, which, at the time, was the fastest lap of the race. And when Dan Kneen ran straight on at Mather’s Cross on the final lap, it promoted him up the order to fifth, just over two seconds behind race winner Alastair Seeley. The 37-year old also enjoyed a strong ride in the earlier Supersport race, slotting into third on his Triumph at the end of the first lap. He then promptly ran wide and onto the kerbs at the chicane, but quickly regrouped and remained in third at the end of the fourth lap with just 1.7 seconds covering the leading eight riders in a thrilling race. A small technical problem on the final lap dropped him back to eighth at the chequered flag, but the ride served as a warning to the opposition that he’ll be a major threat at the Isle of Man TT. The Superbike races were also challenging affairs for the team, but after cruelly forced to retire from the opening seven-lap encounter on the last lap, when lying eighth, both Johnson and the team bounced back to record the same position in the feature Superbike race. Johnson also set further 121mph-plus laps on the Kawasaki ZX-10R. “All in all, today’s gone very well,” he said. “It’s been nice to be back at the North West 200 and nice to battle with the leading pack and run competitive lap times in some good company. He added: “We always knew we wouldn’t be running our best Supersport engines here, so to run in third place for much of the race bodes well for the TT, while the Superstock bike was flying and at one stage I was the fastest man on track. “A close fifth was a good result, and although we had a few little niggling issues with the Superbike, the bike felt very stable at high speed and it was nice to get a decent finish in the last race.